Roaming through Chinese supermarkets is certainly my idea of a good time. Holding a basket, I can go through all isles as if I have to study it all. I read the packaging for different brands, I hover above their frozen food section, I stare at their collection of vinegars (for example), and I check out their vegetable and fresh fruit section. It can be fun to try out things you haven’t seen or eaten before. 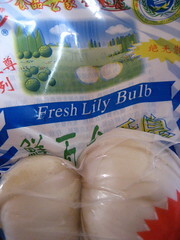 So, last time I was in the Chinese supermarket I stumbled upon this strange foodstuff: fresh lily bulbs (鲜百合). They were on a rather large display, selling 2 bulbs for 1 euro. I couldn’t resist trying, but in the back of my mind was the famous Dutch horror story of a whole classroom of primary school students, who were given flower bulbs to eat by their teacher as a school project. The idea of this was to have the students taste the bitter times of the ‘winter of hunger’ of 1944-45, when there was a famine in the west of the Netherlands, so the local population started eating tulip bulbs for nutrition. Unfortunately, this particular teacher didn’t know which flower bulb was edible and which was not. He boiled the bulbs of narcissus instead of tulips and got the whole school sick. Would these fresh lily bulbs be edible? Or only after simmering for hours with certain herbs or flavours? These white lily bulbs have the size of a garlic bulb or small onion, and I was quite at loss at what to do. So I read the package. It said they were from the highlands of Lanzhou in Western China, and highly valued for their sweet, crisp and refreshing flavour (plus their nutritional value of course). They were traditionally a tribute gift for the imperial court. If you want to eat them raw (package says), use them in cold platters or have them with Western style (!) salads. For stir-frying, fry no longer than 1 minute or they will lose their sweet flavour; if you decide to cook them, do not cook more than two minutes. The funny thing is the package says you could also use them in Western style cakes and sweets – has anyone ever heard of lilies used that way? Anyway, I wiped them clean of their Chinese yellow earth, peeled off their petals, which looked beautiful, and had a bite. They were indeed very crispy, with a sweet tinge, they had a crunch like raw Belgian endives (witloof), but a much sweeter and crunchy taste. I used them in a (western-style) salad (picture here) and quite liked them. Now I still have to think of a nice way to use them in a sweet dessert, or have them as a receptacle for blue cheese, cream cheese, or some other spread as an amuse! Anyone who hasn’t tried Fresh Lily Bulb is missing out on a fabulous culinary treat. I’ve been using these bulbs for about 20 years, ever since I was introduced to them by a Chinese friend in Toronto. When I began using lily bulb, they were quite inexpensive. The price has been elevated to more than ten times what it was back in the day but, since they are still as nature intended, i.e., not genetically modified, they are seasonal and one expects to pay dearly for real food in these days of “soylent green-ness”. One must be careful to wash them in a chlorine solution and cut away the mould that grows on them even inside the vacuum packaging. I use lily bulb exclusively as a salad or smoothy ingredient, never applying any heat to the delicate petals of the bulbs. Lily bulb has the effect of estrogen for me and so I am judicious in my use of it, never eating more than four petals in a day.